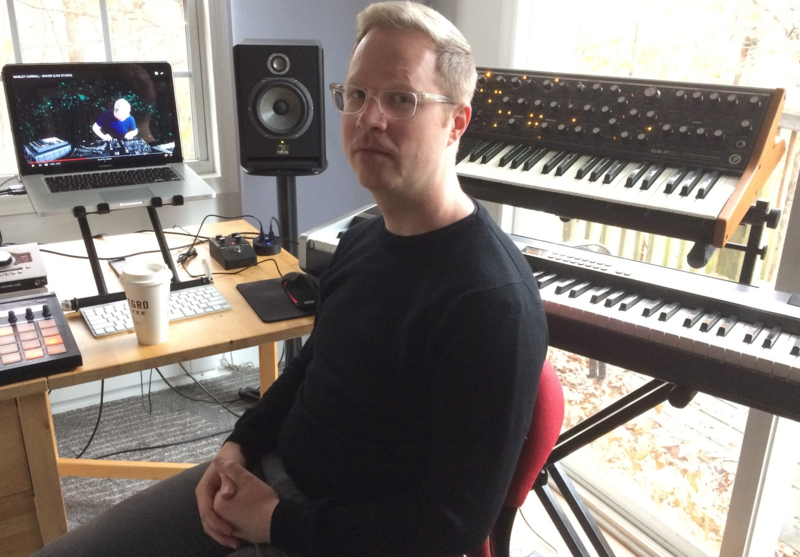 At first listen to his new album, it would be easy to cast Marley Carroll as a musician whose instruments are a computer and software. Marley Carroll in his home studio. Carroll’s keyboards, Mac laptop and rhythm machine fill the living room of his tiny one-bedroom near the Western North Carolina Nature Center. But before he ever touched synthetic sounds, Carroll had a grounding in roots music. He remembers soul and R&B in the home. He studied drums and percussion and played in punk bands during high school. When he began exploring his own musical voice, he drew from Radiohead’s Kid A era electronic music from the UK such as Aphex Twin. At the same time, he developed an obsession with turntabling and won a DJ contest at 16. Carroll relates attending a revelatory performance in Charlotte of the Bay Area turntable crew the Beat Junkies. “They did a routine with all five of them and one turntable apiece, and it was almost like seeing a five-man percussion ensemble, but they’re using horn sounds and pianos and high-hats,” he recalled. After going through his school’s International Baccalaureate program, Carroll considered bioengineering before committing to a future in music. He attended CalArts on a percussion scholarship, but changed his focus to music technology. Carroll moved to Asheville 10 years ago after picking up a Band of Horses album and learning it was recorded at Echo Mountain Studios. Carroll never landed the internship there that he sought. Instead, he was working for Charlotte Street Computers when he decided to give up the proverbial day job and focus on landing more DJ gigs and creating his own music. Among the blips of attention Carroll captured with his own music, a record label asked him to produce an album solely of instrumental music. The result is “Flight Patterns,” a new album inspired by both the visual and sonic elements of birds. The album-release show for “Flight Patterns” is Dec. 14 at the Mothlight in Asheville. “It wasn’t the kind of thing where it was conceptualized to be one unbroken piece of music, but it can certainly interpreted that way, and it should be enjoyed that way, for sure,” Carroll said. Marley insists music without vocals can be just as expressive and compelling as music without. Carroll sees himself as an introvert and reluctant social media presence, but he’s stepping up his visibility both online and on tour. He performs with a turntable, bringing a live element to accompany his programmed beats and sounds, but Carroll says he wants to perform more like a band and less like a DJ. Listen to the Asheville band Town Mountain, and you hear mandolin, banjo, the twang in the harmonies—all the markers of bluegrass. But listen a little more closely. There are socially conscious lyrics and, on the new album—gasp—a drummer. From early on, band members say Town Mountain never quite fit within the bounds of traditional bluegrass.